← Good Morning, Vegan Cinnamon Espresso Chocolate Chip Cookies! 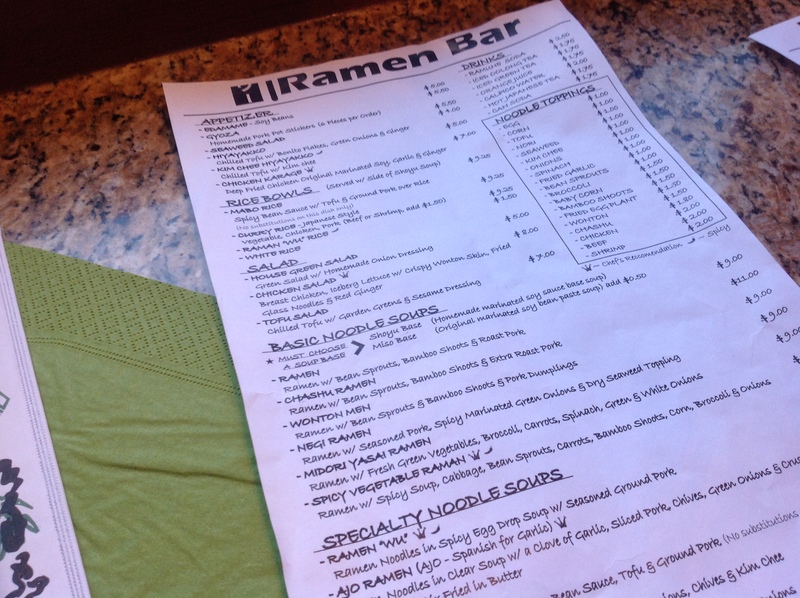 There’s no hidden agenda to the Ramen Bar’s menu. It’s right there in the name. You came for ramen, you’re going to get ramen. That being said, there are options for those not inclined to dine on noodles – a decent selection of appetizers, as well as salads and rice bowls (basically reformatted versions of their ramen dishes). It would be silly, however, to dine here for the first time and not try the eponymous meal. James and I opted to split the difference – I went with a rice dish, he went with a ramen option. The results were mixed. 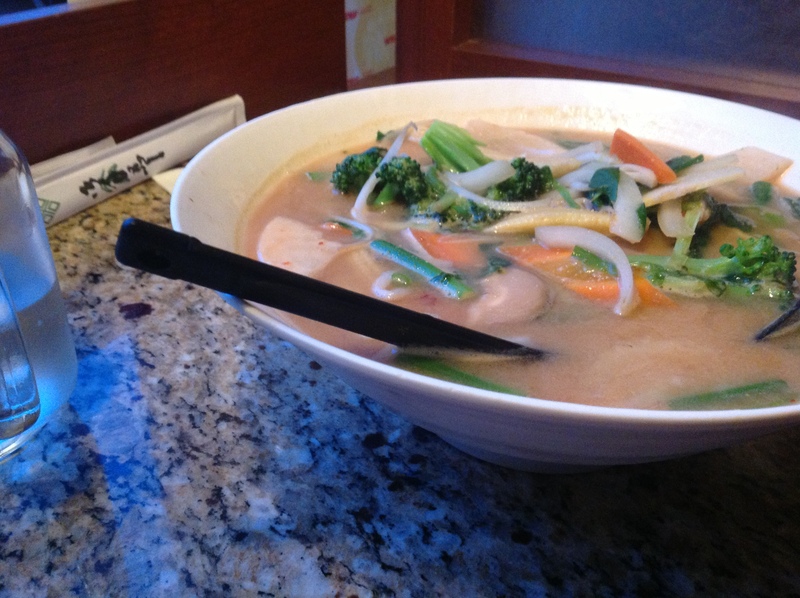 James’s selection was the Spicy Vegetable Ramen, a blend of noodles and various veggies in a salty, mildly spicy broth. Right away, something seemed off. Like any man with good culinary taste, when a dish is hitting the right notes, you can tell by the rate of consumption. If he’s scarfing a meal down, chances are it’s pretty darn tasty. Thus, his hesitation with his dish was noticeable in the way he picked and nibbled. The shitaake mushrooms were quickly removed from his bowl and placed into mine. Some noodles were slurped up, some of the broccoli and other veggies were nibbled in an exploratory fashion. The broth lie mostly untouched. He complained of a lack of flavor in the veggies, citing them as over-cooked and under-seasoned. The broth, while not lacking in flavor, was too much on the salty side and not enough on the spicy side. The lingering aftertaste of the miso base didn’t help matters much. While I found the broth more appealing than he did, I couldn’t argue against his general opinion. It was a dish that felt irritatingly unfinished. I opted for the Japanese-style curry rice, with added egg and tofu. The toppings really make all the difference. Sans egg, the dish lacked a certain cohesion. (Of course, what can you expect from a bowl of rice with vegetables? It doesn’t actually seem fair to critique a meal for lack of cohesion when it is essentially based around the notion of components.) With egg, the lightly cooked vegetables and gluten-y, stick curry rice were much better pronounced in each bite. The tofu was largely redundant. Next time, I’d probably opt for something crispier, something to give the dish a much needed crunch. The one nagging issue with my dish was a disappointing lack of flavor. It felt like it was there somewhere, but not quite present where my palate could recognize it. The abundant flavors of the dish were elusive. Sans egg, most bites were slightly bland and more than a little gluey. Still, I wouldn’t call my experience at Ramen Bar a complete disappointment. James was much more vehement in his dislike than I. The failings of the dishes we chose could be rectified through careful topping choices, a getting-to-know the menu process that will probably not appeal to a lot of diners, but is true to the nature of this type of meal. 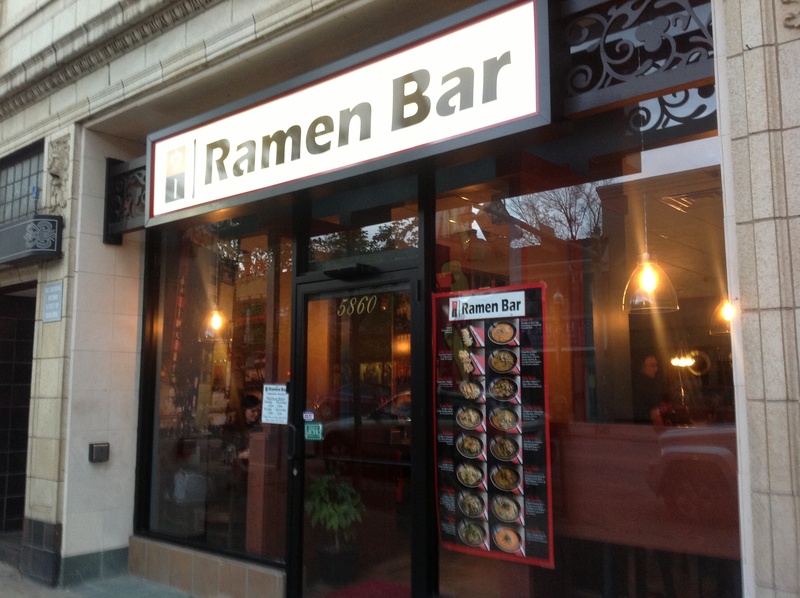 Whatever its shortcomings, the Ramen Bar does not lack for potential. For those who want perfectly configured, fine-tuned dishes, you may want to skip the Ramen Bar, unless visiting with regulars. For those who like a little adventure and a lot of choices to their meal options, you might want to give this curious little place a try. Especially if you’re nostalgic for shiny plastic packages of freeze-dried noodles and salty bouillon, but have definitively aged out enjoying that particular culinary experience. 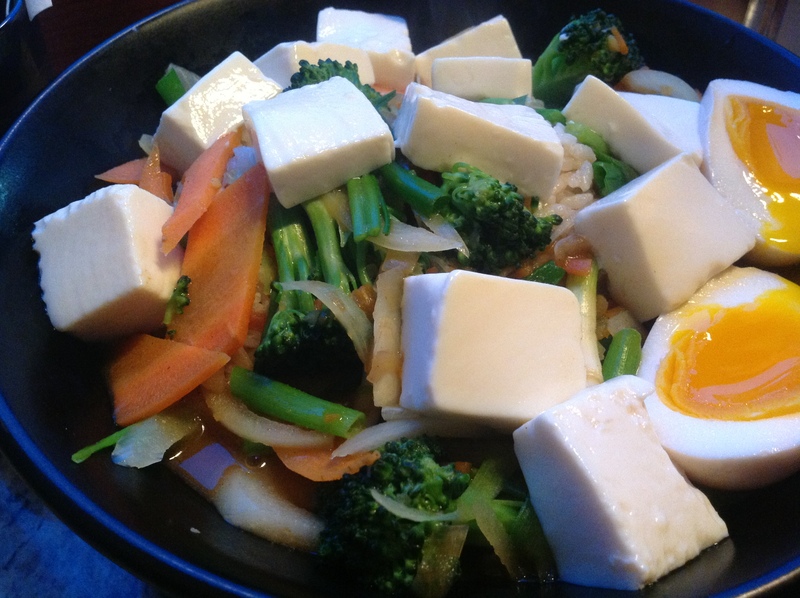 This entry was posted in Dining Out, Food and tagged asian food, dining out, dinner, food, pittsburgh restaurants, ramen, ramen bar, ramen bar pittsburgh, restaurant reviews, restaurants, squirrel hill restaurants. Bookmark the permalink. There’s always room for food adventure if the cost is low. Fortunately, as a student in the late 1960s I did not eat at the university cafeterias. Yet on a self imposed budget of $2.65/day ($13.00 in 2013 $), I ate very well without resorting to fast food. I researched & ate at local restaurants – this was in Milwaukee. Although I applaud this venue for trying to “upscale” fast food – it’s a hook – you’re correct, adjust the seasoning!